BIG card collecting = BIG Fun! They didn't come with gum. They didn't come in packs. They weren't made by Topps or Leaf or any other trading card company. But they're cards just the same and fun to collect. If you're the type who likes the larger things in life, then you'll especially love these sets, because they're big. BIG! Take for example Prehistoric Animals Flash Cards (McGraw-Hill, 1962). These cards measure 6 X 3 inches! The color artwork is excellent, though none of the artwork has any backgrounds. They just feature the Dinosaur, caveman, or prehistoric mammal against a pastel back drop. The text (on the reverse) is very detailed and a fun read. My set has 47 cards, but I suspect they originally had 48 or 50 in the set. I remember seeing these cards as a kid and they were just as fun back then. Monster Old Maid (Milton Bradley, 1964) are monster sized as well. They measure 3 1/2 X 5 3/4 inches. These cards feature head shots of Dracula, the Wolfman, The Mummy, the Creature, the Hunchback, and so forth. There are 20 different pictures with duplicates of all but one (the "old maid" is Dracula's Daughter). The photos are black and white with green or purple shades. There are other "Old Maid" games available from the TV shows "The Munsters" and "The Addam's Family". These are pretty similar except the diversity of photos is much less than Monster Old Maid. (They use more duplicates of the same shots). I'm also told there is an Old Maid game of "12 O'clock High". Apparently, that one's pretty scarce. Ever see the Odd Rods type set of exhibit cards from Exhibit Supply (1972)? These look like post cards, measuring a little over 3 1/4 X 5 1/4 inches in size. The two-color artwork is rather crude, like something the pimple faced kid in the back corner usually drew during History class. There's plenty of big tires, peeling rubber, and big eyed monster drivers. The reverse is less creative (completely blank). There are 16 in the set. And speaking of postcards, Star Trek collectors will want to pick up the 1977 post card series. There are 48 color Star Trek post cards in the set. They were initially sold in a booklet, but the cards are often detached. The photos include shots of the Enterprise, its crew (most the stars) and a few aliens. The backs have a 1977 Paramount copyright. Another fun post card set is unusual in that it breaks all the assertions made at the beginning of this article. Insult Postcards were released in 1966 by Topps (in packs with gum). They feature neat color caricatures of various monsters delivering a variety of put downs. There are 32 in the set and they appear to be drawn by Wally Wood. These cards are often found as singles, but don't despair: It isn't too hard to piece together if you're patient. The smallest "big cards" discussed here are some of the neatest. 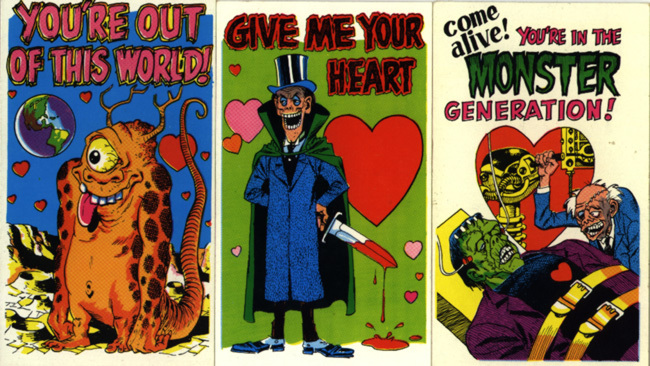 Ghoul Agency cards were produced in 1975 by Athol-Research Company. It was part of a beautiful board game called "Creature Features". It came complete with money, dice, tokens, and several different types of cards- but only 32 of them have photos and are worth displaying. The majority of those photos have never been in any other card set. The films highlighted include the usual Universal line up, plus Willard, Dr. Phibes, Them, and Godzilla. The black and white cards measure 2 3/4 X 3 3/4 inches. There are many other board games that include cards, but Ghoul Agency has some of the biggest and best (in my humble opinion). This isn't a complete list of the big cards, but it's a start. Almost all these sets can be found between $15 and $25 in EX condition. They most often turn up at flea markets or garage sales, or even your attic! Just keep your eyes open for large unidentified lying objects and you're bound to see them sooner or later. After all, they're BIG!